I love ice cream and Italian ices and debated trying to sketch some of each before they melted. But with temperatures nearing 100 degrees in New York City, I REALLY love something that cools me for more than 10 minutes and that is the combination of our ceiling fans and window air conditioners. My husband and I alternate between our library and master bedroom these days when we're home and turn the fan on when we enter the rooms and off when we leave. 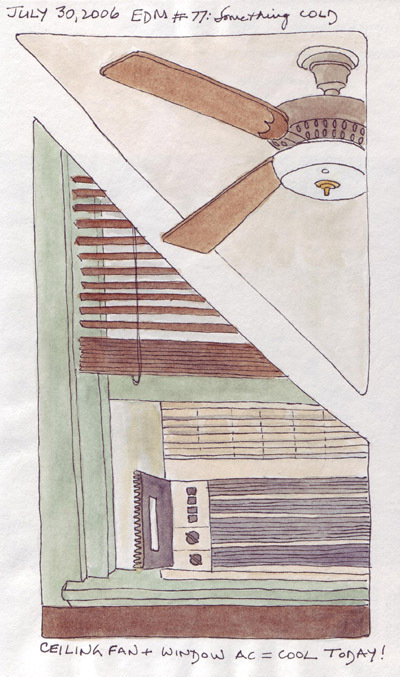 The AC is essential for sleeping, but we rarely need to use during the day. 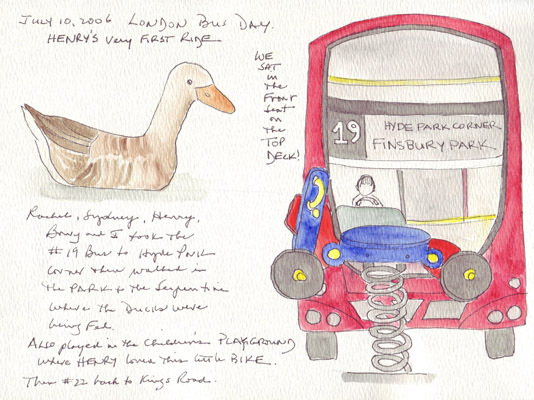 We spent many mornings with our grandchildren during our visit to London and these sketches were from a larger group that were done during our special outings so I could remember the moments. We took a walk to South Kensington with both Henry and Syd so our daughter could take us to Harrods - the excuse being real American Krispy Kreme doughnuts. Henry loved this 3 foot London Bobby who appeared randomly around the store to remind shoppers about store surveillance and then selected the large chocolate replica of Big Ben for me to sketch next. We had an exciting visit to the Natural History Museum dinosaur exhibit. 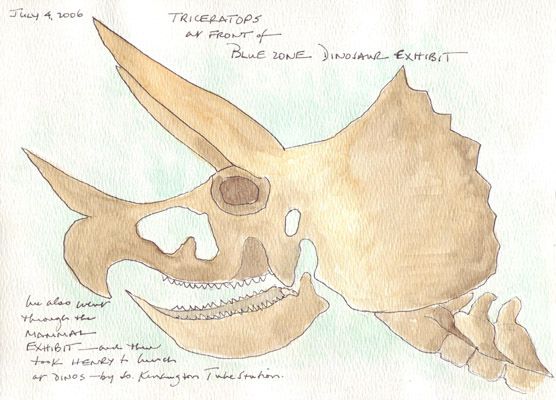 While my husband took Henry to the catwalk-like viewing balconies, I stayed with the stroller and sketched the triceratops skeleton head. Henry wanted to ride on the top of a London double-decker bus, so we planned an excursion for all of us to take a bus to Hyde Park for the morning. We took Henry to the front seat on the top while my daughter remainded with Sydney and her stroller below. We wandered the park, watching ducks being fed in the Serpentine, and spent time in the children's playground where Henry was partial to the bouncey bike. 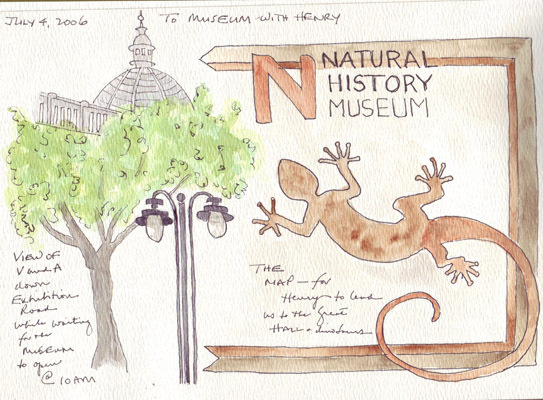 One of our last museum visits was a morning trip with Henry to the Science Museum. He introduced us to the many interactive exhibits for children and then, when asked, requested a book on rockets at the Museum store. The young woman in the store directed us to a wonderful book called "Astronaut For a Day" which was perfect for him. In the afternoon, while the cast of the new Superman movie was in London for a promotional visit, my daughter bought him his own superman costume. 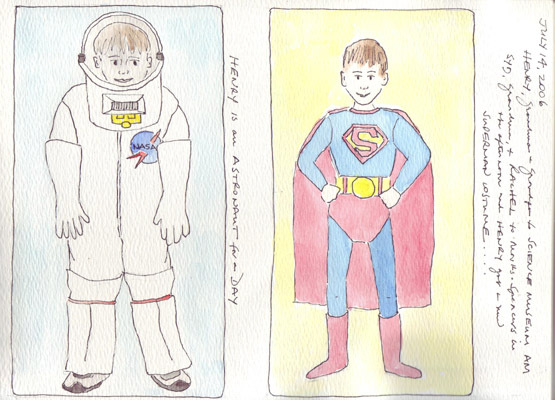 Neither of these sketches are of Henry - the astronaut is from the book and the superman costume is on a "model." He took off his costume to go to sleep but had to take his astronaut book to bed with him. As we were leaving London. my daughter was negotiating with him where it was OK to wear a superman costume. 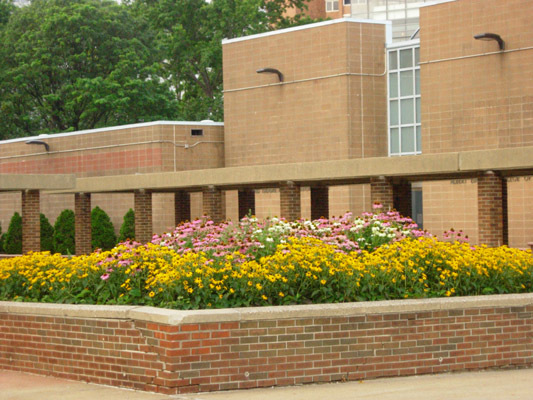 The plaza area on my way between the parking garage and my office was magnificent last week. 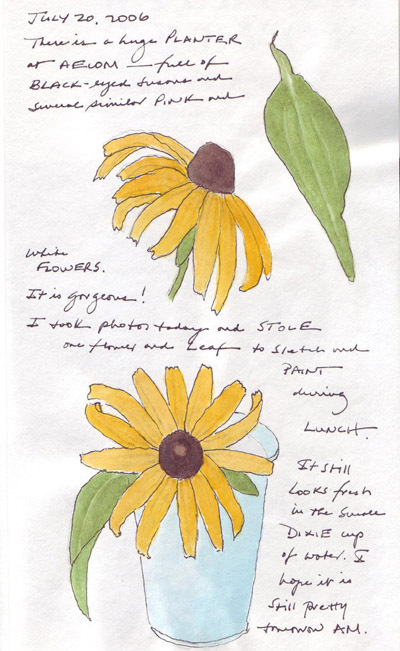 I "stole" a single flower and painted it during the day as it sat in a Dixie cup on my desk. We had dinner with cousins last Sunday in the middle of their wonderful gardens. 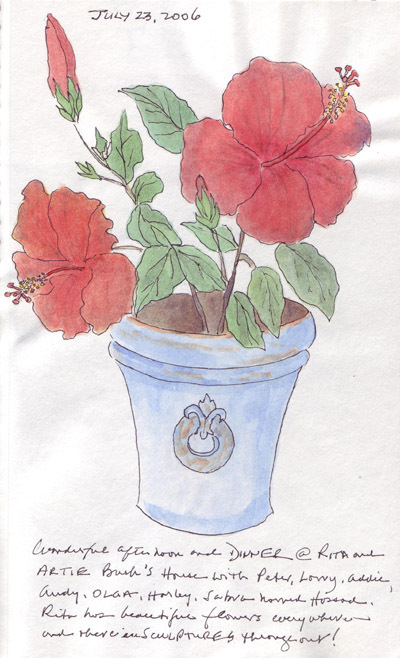 This hibiscus plant was sitting on the deck and I couldn't resist taking time to paint it. The plant was much fuller, but I needed to simplify it to be sociable! 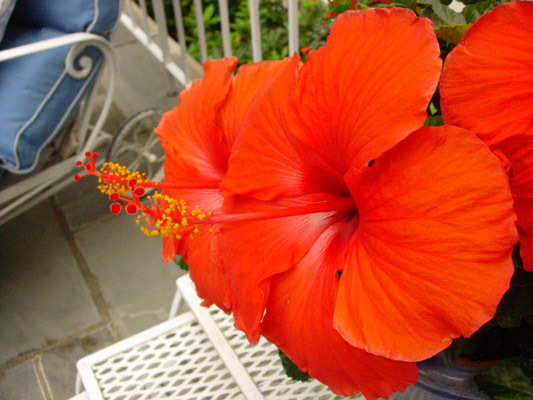 Hard to believe that I was painting a hibiscus in London exactly one week before. 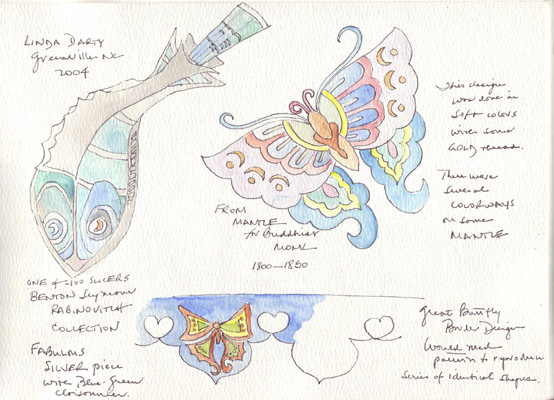 These were sketched with a Pigma micron pen in an Aquabee Globetrotter Sketch Diary (70 lb paper) and painted with Niji waterbrushes and Winsor-Newton tube watercolor paints. I sketched the actual flowers and took the photos later because they were so beautiful. During our recent visit to London, my husband and I visited Museums while our grandchildren were busy with other activities. 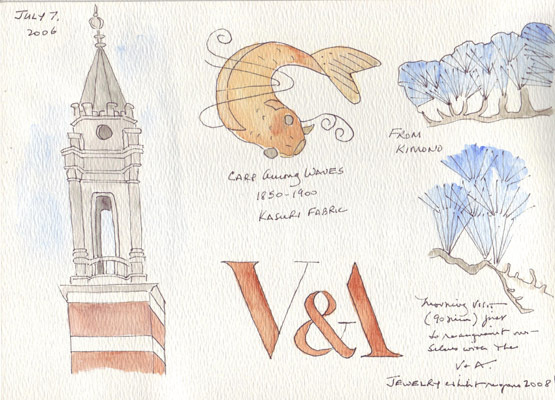 I really wanted to sketch/paint at least one page from each visit in my Travel Sketchbook, but needed to choose things to sketch very carefully - based on their complexity. My interests in textiles makes it natural for me to gravitate toward colors and designs so many of my sketches captured those passions. I chose some representative museum pages to upload here. Tate Modern: We walked across the Millenium Bridge for our first ever visit to the Tate Modern. 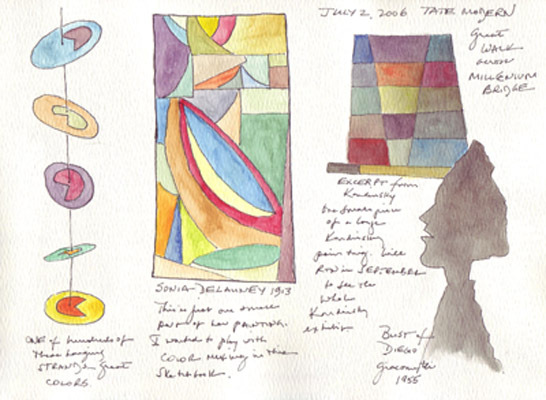 As we viewed the permanent exhibits, I was attracted to the brilliant colors of one strand of a hanging installation, a part of a Sonia Delaunay color block painting, a very small part of a Kandinsky painting and a Giacometti bust. It was our first full day in London and we decided to save the Kandinsky special exhibit to our next visit. British Museum: The museum changed so much since our previous visits, but I was still attracted to the Elgin Marbles and specifically this horse's head. 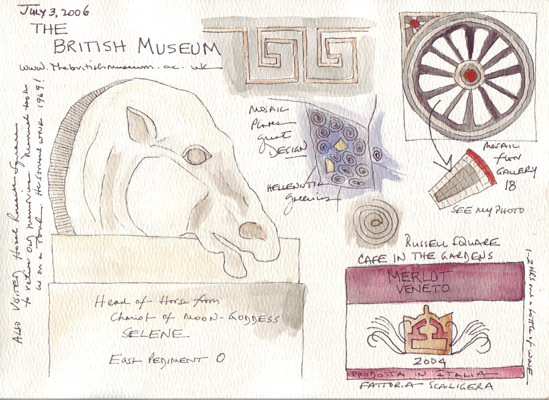 The upper right part of the page shows some mosaic designs that I loved in the Hellenistic Galleries. The wine bottle label is from the bottle that we shared enjoying the late afternoon "people-watching" in the outdoor Russell Square Park Cafe. Victoria and Albert Musum: One of my long time favorite places in London! Unfortunately they are doing lots of renovations and the jewelry exhibit won't reopen until 2008. However, I found lots of designs that I loved in the Japanese galleries and was completely overwhelmed by a modern set of 100 silver cake slicers commissioned from the world's best silversmiths by a US Chemistry professor named Benton Seymore Rabinovitch. I only sketched the silver/blue cloisonnier fish from the collection, but could have spent all day in front of the exhibit cases. None of the quilts in the V&A collection were on open exhibit. I definitely need to invesitgate this before our next visit. 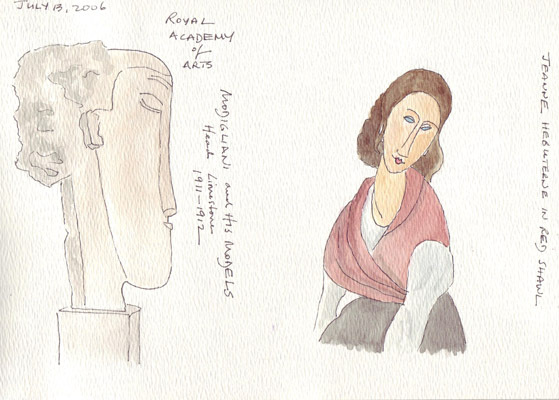 Royal Academy of Arts: There was a special Modigliani exhibit at the Royal Academy - 1 piece of sculpture and approximately 40 of his paintings. His 3rd mistress, Jeanne Hebuterne, was the model for many of his last paintings and she watched over him as he died of TB meningitis in his 30s. 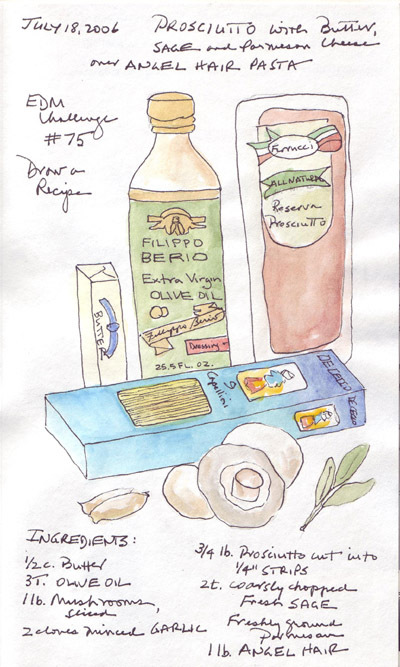 I was concentrating so hard on the # of grams and millilieters when I made this for dinner in London, that I didn't have enough energy to also sketch and paint the ingredients. 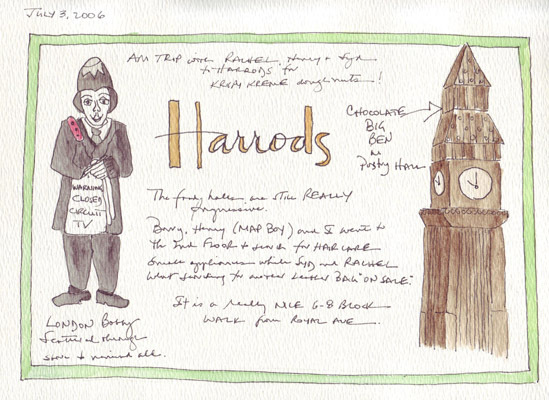 But I wanted to remember this sketch as one of my recent London journal entries, so here it is. These ingredients are sauteed together and then put over al dente angel hair pasta. The dish is then finished with freshly grated Parmesan cheese.